First Aid Only, Inc. specializes in first aid and emergency preparedness kits and supplies, developing packages and distributing first aid products to individuals and organizations throughout the United States. They are headquartered in Vancouver, Washington with a 1,000-strong distributor network, and currently own 40% of the retail market for first aid kits. First Aid Only, Inc. has consistently developed cutting-edge, first-of-a kind products and solutions for first aid, and more recently, emergency preparedness. Additionally, they continue to join forces with some of the most well-known humanitarian and healthcare organizations in the world. First Aid Only, Inc. was having trouble maintaining their outdated ADD+ON software, which was completely character based and had no flexibility. Their 130 employee staff was required to memorize manual key strokes to input orders, invoices and all business data into this outdated, green screen system. The amount of time needed to complete these tasks made it nearly impossible to implement any business process improvements. First Aid Only, Inc. was unable to integrate with other systems and business tasks, including their fixed asset, payroll, and financial departments. First Aid Only, Inc. packages and distributes about 200 orders every day, varying in size from 1 to 200 kits per order. Each of these orders is in multiple units of measure, and their outdated system forced them to maintain a separate part number for each unit, making the quantity of part numbers almost too large to be handled effectively. In addition, the business rules forced them to drive inventory into the negative and did not handle multiple sources of allocation in a timely manner, causing many errors and delays. Despite the limitations First Aid Only, Inc. faced with their out-of-date software,the company was growing. They needed a system that could keep up with the innovation that First Aid Only, Inc. brings to the medical supplies industry. InterDyn - Remington Consulting reached out to First Aid Only, Inc. in March of 2009. It didn’t take long for First Aid Only, Inc. to realize the potential benefits that Microsoft Dynamics® GP and Microsoft Dynamics® CRM could generate for their organization. InterDyn - Remington Consulting showed them the significant benefits of integration throughout their business processes and the ability to automate everyday tasks. First Aid Only, Inc. launched Microsoft Dynamics GP and Microsoft Dynamics CRM in November of 2009 with InterDyn - Remington Consulting. First Aid Only, Inc. started with a basic “out-of-the-box” installation of both programs. They felt that they had created so many work-around processes with their old system that they didn’t want to bring those potentially “bad habits” to the new solutions. They elected not to customize Microsoft Dynamics GP for their processes at first, but to work with InterDyn - Remington Consulting to determine the best practice processes for their company. InterDyn – Remington Consulting engages clients in a 3-step Business Process Improvement approach that helps organizations identify what processes to change, and how to change them. First Aid Only, Inc. does not have any internal IT staff, so they also rely heavily on InterDyn– Remington Consulting for support. Because of this, they signed up for one of InterDyn - Remington Consulting’s annual support plans that ensures they receive the resources and advice they need to create streamlined business processes across all departments. First Aid Only, Inc. has had very few issues since implementation, but when issues do arise they can count on InterDyn - Remington Consulting to provide the assistance they need in a timely fashion. Steve Porter, Controller of First Aid Only, Inc. says, “Their knowledge of the system and ability to work with us to design our business processes to maximize our utilization of the system has been very impressive.” Steve has also worked on similar projects in the past for another company and states that the staff at InterDyn -Remington Consulting have been some of the most knowledgeable people he has ever worked with. First Aid Only, Inc. has recently created a new business model in fundraising thanks to their Microsoft Dynamics solutions. They provide organizations with first aid kits to sell for their fundraising efforts instead of selling candy, popcorn, or cookie dough. This offers a much more practical and healthier alternative to the standard fundraising fare and First Aid Only, Inc. can efficiently manage this new business process due to Microsoft Dynamics. Microsoft Dynamics CRM maintains the contacts needed for the program and allows for more frequent communications with fundraising organizations. First Aid Only, Inc. is proud to make a difference in the medical community and Microsoft Dynamics CRM helps to make that possible. First Aid Only, Inc. now has visibility into what medications are in each kit at any given time. If something is recalled, they can do a search within Microsoft Dynamics GP and see which kits they need to disassemble or recall from the field. Although this hasn’t happened since the new implementation, it has the potential of saving them a significant amount of overhead expense and stress. First Aid Only, Inc. is now confident they can meet FDA regulations at any point in time and better yet, they can prove it with the capabilities of their new solutions. The Microsoft Dynamics solutions also perform cycle counts which allow First Aid Only, Inc. insight into every item they have in stock. 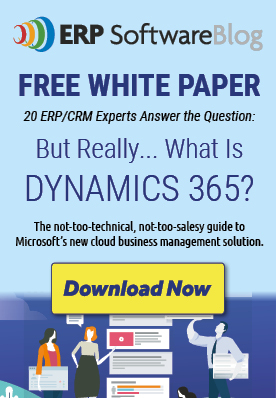 Microsoft Dynamics GP doesn’t let them to go into the negative for their inventory and it forces them to deal with any allocation issues immediately, resulting in happier consumers and boosting employee morale. Inventory purchasing and production also have better forecasting ability and visibility into demand. Microsoft Dynamics GP allows First Aid Only, Inc. to have different units of measure for each product within the system, without having to create different SKUs for all of them. This has allowed them to eliminate almost 100 SKUs with the possibility of even more SKU consolidation in the future. Efficient communication and visibility into inventory allows Customer Service to provide more accurate shipping dates to customers. This has increased customer satisfaction and reduced the amount of time Customer Service has to spend researching and resolving issues. Microsoft Dynamics GP and Microsoft Dynamics CRM are streamlining business processes for First Aid Only, Inc. and making it possible to create new business models. First Aid Only, Inc. could not have gotten this far without their partner, InterDyn – Remington Consulting and the application support they provide every day. Companies in the Life Sciences industries must stay ahead of the curve and ensure quality is effectively managed, documents are properly controlled, and products are tracked across the supply chain. Solutions from InterDyn – Remington Consulting, along with their experienced consulting services, enable life sciences organizations to quickly deploy integrated and cost-effective business applications that address complex business needs. Watch the video interview with Steve Porter, Controller of First Aid Only, Inc.